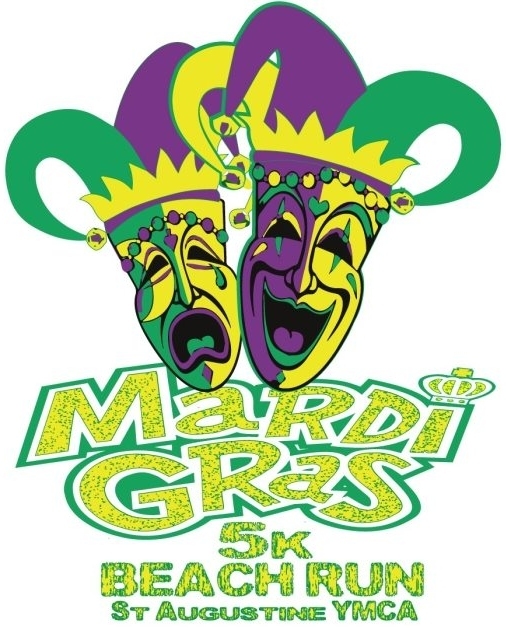 Invite your family and friends for the 4th Annual Mardi Gras BEACH 5K in the country’s oldest city! The race will begin in Anastasia State Park and head north to run on the beach in the State Park! Proceeds will support St. Augustine YMCA's Annual Campaign. The mission of the YMCA is to put Christian principles into practice through programs that build a healthy spirit, mind and body for all. Each year St. Augustine YMCA awards to individuals and families of our community over $100,000 in membership and program participation fees. Funds raised in this event will help ensure that no one will be turned away because of inability to pay, as well as swim lessons and camp for children. Registrations are non-refundable. In the event of inclement weather, your donation will go the the St. Augustine YMCA Annual Give to the Y Campaign to aid in assistance for families who can't afford Swim Lessons, Afterschool Programs, Summer Camps, Sports Programs and much more. Every participant will receive a Dri-fit race T-shirt! Shirts are guaranteed if registered before 2/4/2019. Bring your race bib to Salt Life’s Upper Deck starting at 12:00 pm for a free beer or soft drink (race day only). Parking will be first come first serve at the State Park located at 1340 A1A, St. Augustine, FL 32080. Parking is limited, participants are encouraged to carpool if possible. Awards to the Top Overall Male and Female and the top Male and Female in each age group. 9 and under, 10-14, 15-19, 20-24, 25-29, 30-34, 35-39, 40-44, 45-49, 50-54, 55-59, 60-64, 65-69, 70-74, 75 and older.